RFMW, Ltd. announces design and sales support for Skyworks dual-band, internally matched, SP4T switch developed for WiFi applications in the 2.4 and 5GHz ISM bands. The Skyworks SKY13575-639LF supports access points and CPEs along with WLAN test and measurement equipment. Frequency coverage is from 100MHz to 6GHz with a maximum insertion loss of 1.4dB. Isolation ranges from 26 to 40dB and the SKY13575-639LF can handle up to 32dBm of input power for demanding applications. Processed using SOI technology, this Skyworks switch consumes less than 10 micro amps of current. Built-in decoders limit the number of GPIO lines needed for control and internal matching eases design considerations. 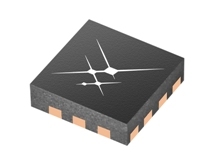 The Skyworks SKY13575-639LF is offered in a tiny, 1.6 x 1.6mm QFN package.